The primary markets for geospatial solutions for Bentley software appear to be utilities and civil. As the data that can be put into a building information model becomes more complex and analytical, the need to incorporate some level of analytics and spatial information becomes greater. 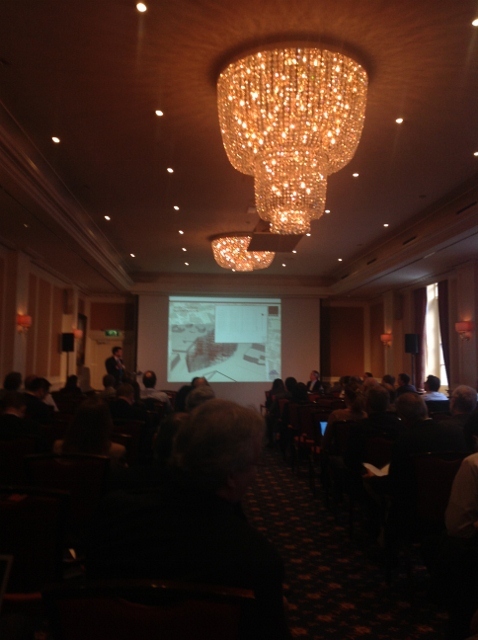 Four geospatial-type technology previews were shown at the Be Inspired 2012 Conference in Amsterdam this week. The conference showcases the work of finalists in the Be Inspired competition for customers who have used Bentley software in innovative and game-changing ways. A new release of Utilities designer will offer faster, higher quality, more resilient designs, lower total cost of ownership and does not require replacement of existing GIS. The word is that Utilities Designer will be packaged as a standalone product. Bentley Map Mobile is probably one of most exciting announcements this week. The mobile map app allows you to view the most up-to-date information on tablets, work with spatial information without being a GIS specialist, redline, and edit attributes of the geospatial features on tablets. Bentley Descartes V8i (SELECTseries 4) provides support for point clouds. Faraz Ravi , director of project management for Point Clouds at Bentley, said that the new release would establish existing point clouds. Point clouds are a very rich detailed and accurate millions of points captured typically with a laser scanner, and can be black and white or color. Point clouds have become important for classification, where in the early stage of projects we collect geometry. How can we model projects’ context quickly and cost view efficiently? At the initial planning stages point clouds can be for planning studies feasibility, massing, and view shed analysis. Besides Bentley Descartes, there is high quality movie output in Bentley Pointools v8i. The camera can view from any viewpoint, access dangerous environments, be used by non-specialists and is easy to use. They can be used instead of vector models as design elements and for clash detection. A use that seems close to a geospatial task isusing point clouds in the resampling of crops, which currently is not an intelligent activity. Beyond the four technology previews outlined above, some other developments suggest geospatial has been integrated into Bentley AEC workflows to some degree or another. Ron Gant, civil engineering director, said that many professionals want to know, how can I manage diverse geotechnical data acquired for a project? The Bentley product gINT acquired four years ago, aggregates data from different sources for analysis and mobility and incorporates that into an information model as an asset. This is achieved with interoperability and live linkage. Although it is not a new product, it is a tool that can provide important data to a GIS environment. “In order to bring data into geospatial environment we’ve integrated gINT into Geo Web Publisher V8, that can draw selection set and bring data out,” said Gant. Geoweb Publisher allows you to do sampling and original test sampling. gINT also integrates with Esri’s ArcGIS. An important partnership was formed recently between Trimble and Bentley Systems. Trimble has been well known for its reputation as provider of construction solutions for heavy, civil and building contractors, and also its skills in the area of field positioning technologies such as robotic total stations, 3D laser scanners and global navigation satellite (GNSS) positioning solutions. The alliance will give construction professionals a greater insight into construction problems and provide Bentley tools with enhanced positioning solutions that they have not had before. This entry was posted on Tuesday, November 13th, 2012 at 2:32 pm. You can follow any responses to this entry through the RSS 2.0 feed. You can leave a response, or trackback from your own site.